Quilting in My Pyjamas: Done and Dusted. I blame all those scrappy trip around the world quilts that I saw at various times in 2013 for the birth of this quilt. They all looked so pretty but the idea of having to work out how to put one together hurt my head a lot so I decided to make a postage stamp quilt instead. The added bonus of clearing out the scrap bin a little added to the motivation factor. Plus, I hadn't made a quilt in ages that screamed "LOOK AT ME, LOOK AT ME " because of all the colour in it. So being the highly motivated individual I am, three test blocks got made in August last year then I promptly ignored this quilt until January. I decided on simple straight line quilting because that much colour and that many fabrics don't need anything else. 1280 squares of 2 inch fabric and a finished size of 72 x 72 inches. Dotty binding in a hot pink . I love dotty and stripey binding. I machined the binding on because this is going to be an every day quilt that gets a lot of abuse use. Another WIP bites the dust .... I really am quite pleased with the over all look of this quilt but I'm happy to move on to something else. That something else would be the triangle quilt that's been lurking for an inordinate amount of time because bias edges in this house usually end up having their own little Mexican wave party while I'm sewing them together. Wish me luck. 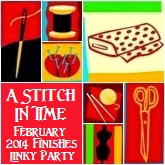 Linking up to Elizabeth’s Stitch in Time linky party. Come and play! P.S. I almost talked myself into starting something new this week ...I have some Bliss fabric that has started calling my name really loudly! But I put my big girl undies on and I will prevail over the triangle quilt before I give in! Another gorgeous quilt... love the chenille backing....it's gotta be cuddly. So pretty and the chenille will give it a fabulous weight. And another finish. Go you! Yay!! What a fun colourful quilt! Too right it's going to get used a lot, that cosy chenille would make it irresistible. I admire machine binding, I'm terrible at it so I stick to hand binding. What a fun quilt.....and what a good idea to use the chenille for backing, it will be very cosy and snuggly! Love your quilt and the chenille! Great job. Gorgeous! I love me a scrappy postage stamp quilt! Lovely! Love your scrappy quilt! The chenille backing is awesome. Yay for another finish! It is a feast for the eyes...love the chenille backing too! Well done! That looks so nice and bright. The back look nice and snug. I bet that is going to become a hot favourite. Love all those bright colors! It's a fun quilt and with that backing, it's going to be a cuddly one. Congrats on the finish. So cool! Love the chenille back, but do tell, was it a bugger to quilt because of the nap? Two-inch squares, 1200+ of them -- wow, my hat is off to you! It is gorgeous! Absolutely wonderful! So pleased you were able to bring it to completion. Excellent result. I am sure it will be much used. The PS Quilt is gorgeous and the chenille backing is perfect. You should be so pleased. Is this staying at your house? or going somewhere else? Great finish. If only I could get as motivated as you. Wonderful - well worth all the furstration. And that chenille takes me straight back to when I was a kid, and we had chenille covers on the bed! I just love it! Well done, hooray and three cheers clever clogs! Great quilt, great backing and why in the first photo is the quilt draped over your car? Doing the happy dance for your finish. Way to go! Whoop-whoop! It's wonderful! Give yourself a huge pat on the back. Well done! I can see the detail so well from the picture in the sunshine - great job, Shay!!! Spots with pink, little squares and cuddly chenille. This sounds like a perfect big quilt. Love the riot of colours hanging out together there. Enjoy. Wow! I love, love, love this quilt! It is absolutely amazing! 1280 squares of 2" fabric. Shazam! The binding is awesome as is the chenille backing! That is one fabulous quilt! Congrats on a really great finish and thank you for linking up! I just love this quilt. I think the chenille backing is a great idea. It will not only make the quilt beautiful, but warm also! Great backing choice! Oops missed this post. Your teeny tiny squares look awesome, and I love how you've used the chenille for the back. Good call. I can't wait to see this one in person next time I'm at Casa PJ's. Did you use batting with the chenille? I really like the chenille for a back, nice and cosy. I have a LARGE chenille dressing gown in good nick I got from the op shop languishing in my cupboard. Ah the possibilities!!! A gorgeous quilt! I love the pink binding and the chenille. Did you out wadding in it too? Or just use the chenille? Oh, I love, love, love it!! !